Plot Summary: Akito Tenkawa doesn't want to fight. Despite a childhood spent as a fan of the anime Gekiganger 3, a mecha show, he'd rather cook than pilot a mecha. Fate intervenes when his home on Mars is destroyed, and he is mysteriously transported in an instant to the Earth. He has questions no one can fully answer, but follows a girl from a chance meeting in the hope of discovering what has happened to him. 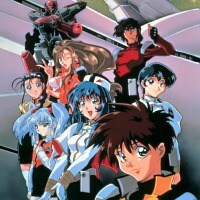 The girl, Yurika Misumaru, is captain of the private battleship Nadesico, and in order to follow her, he enlists as the ship's cook. Possessing the nanite implants that allow him to control mecha, he's a handy backup pilot for the tactical mecha of the Nadesico, the Aestivalises. He joins a crew bent on avenging Mars and composed of misfits, otaku, and ditzes, but who are in reality handpicked experts. They take their own private war back to Mars to face the harsh reality that life may not always be like a giant mecha series. Dubbing Studio: Doblajes Paris S.A de C.V.